I have other photos of this piece but since I had to take it down while decorating for the Holidays I decided to get a few closer shots showing a bit more detail. Acanthus leaves are probably my favorite form to use. I like them simply because you can do so much with them. You can twist them turn ’em, fan them out trail them off etc. Just the perfect form to use to fill a space of any shape or size. They look good as borders around frames, details on edges, pediments, spilling down table legs, the base for columns etc.. Well,, the list is pretty much endless. Here I made the Shell ( approx. 14 inches high) and the two side pieces to sit on some molding that frame an archway between my living room and dining room. It’s done in Basswood and for some reason I decided to leave it natural. 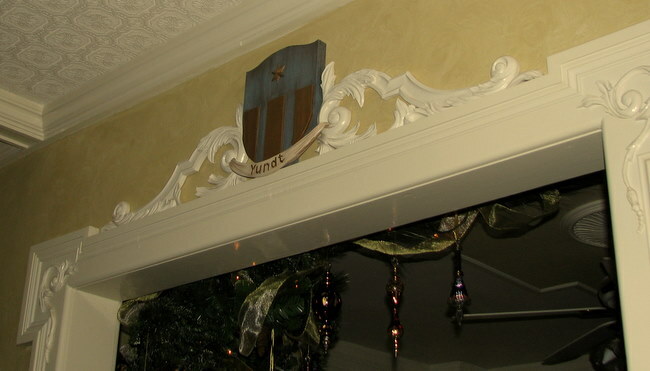 On the opposite side of the arch I carved instead of the shell, my family’s coat of arms and painted that carving. Then again, we have the history of the design and paint seemed natural to really define the piece. A bit of glazing for an antiqued look helps complete the piece. The overall width of the piece with the two side pieces is just under 48 inches. 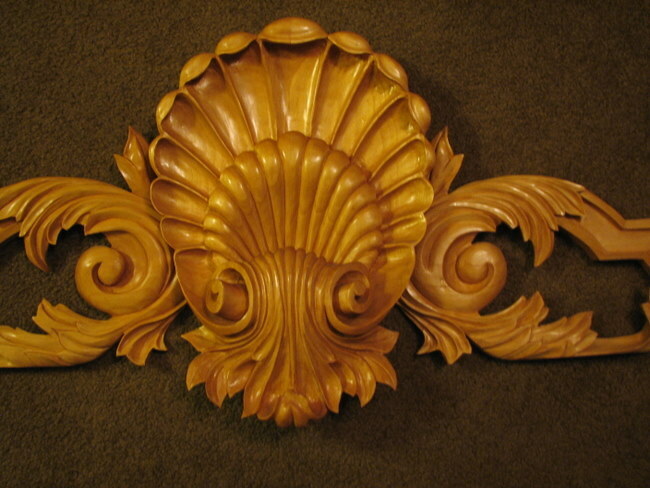 But here you can see how the Acanthus leaves, wrapped around the curves and sweeps of the molding that supports it can look. It’s done in one piece and I tend to think the lines of the leaves accentuate the curves and you can use them to guide your eyes back and forth along the piece creating an interesting carving to look at. The lines move away, curve back , dive and sweep to keep your eye moving across the design. The overall piece. You can imagine a line of molding that this piece would sit on. 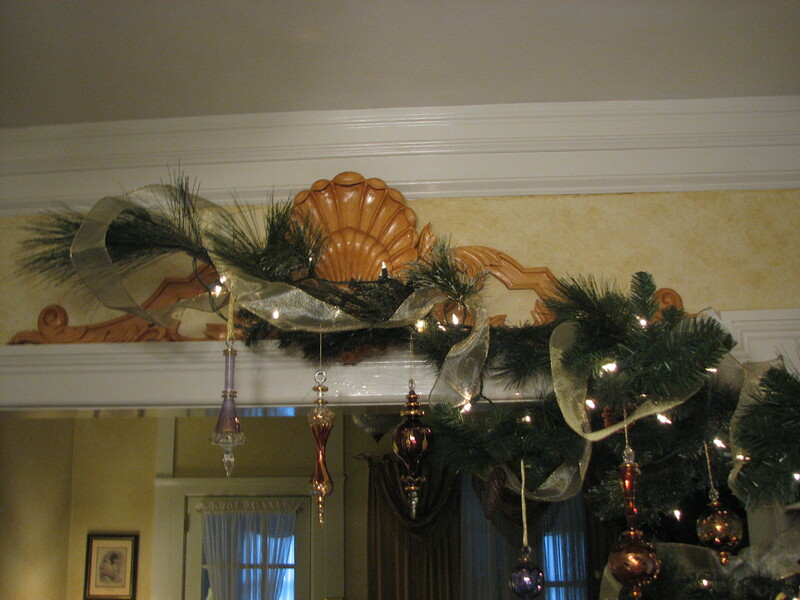 The very center leaves spilling out of the shell actually extend over the molding itself so the piece isn’t restricted to just sitting on top of the molding. A close up of the shell. Here you can see the depth of the piece. This added to the “drama” of the piece. And one of the side pieces. It’s hidden here with the Holiday decorations, a partial arch I built with welded wire and covered in greens in order to display my collection of Egyptian glass ornaments. They don’t hang quite right on a regular tree and this focuses the collection as it branches out in the opposite direction as well. And here is the other carving of the Coat of Arms I mentioned on the opposite side of the wall. You can see I used the same design for the side pieces and just changed the center carving. This piece , like the other , is not fastened to the wall. Even the swag with my name on it is simply held in place by the way it’s carved at the ends, locking itself into the volutes of the Acanthus leaves. Easy to remove to clean, or put elsewhere at any time. I always admire your work. Besides your creativity and vision i admire the nice clean finished look of your work. Perhaps you can comment on how you manage to get that clean finished look. Do you do any sanding? Do clean up as you carve or do you come back at and do the finish clean up at the end. What tools do you use for the final finish? I tend to think that it’s one thing to carve clean, and then another to sand a carving smooth and finish it. The carving I like is pretty much ready to finish when the carving is done with little sanding. Naturally , if you’re sanding just to remove the fine chisel marks for a smooth finish that’s fine. But depending on sanding to make a carving look “clean” doesn’t really work. Cuts have to be clean, lines smooth and crisp, no fuzzies in the corners, bottom cuts not overshot leaving lines in the base wood that all contribute to clean carving. Everything should be defined prior to finishing. Sanding only enhances what’s already there as a final clean up. I don’t depend on sanding to straighten surfaces , lines or edges. If you do chances are you’re not carving efficiently or depending on the wrong tool to do the work. I pretty much leave sanding for the finishing part of a piece. In this case I only used clear finish on the carving. Basswood tends to look blotchy at times with staining. Flat grain vs. edge etc. can cause this. So rather than risk it I just finished it with Lacquer. Generally I’ll complete a carving and then go over it and pick here and there at things that I see. This way I can keep moving over the carving and not have the idea that ” This part is finished and I don’t want to touch it again” syndrome. I’ll rework any part of the carving, take it deeper, reshape it, or whatever it needs at any point. I tend to sneak up on the entire carving overall. I don’t carve one area at a time and call it done. It’s more of a “rough in here” and a “rough in there”. But the sanding and finishing are a separate thing from carving. When the carving process is done correctly you should be able to walk away without doing another thing to it and call it done leaving it in bare wood with no sanding. Then it’s carving done well. With all the carving I do, I don’t use more than a pack of sandpaper in a year. As far as tools for the final finish, if we’re talking about the same thing being the varnish, poly lacquer etc. is usually spray equipment or spray cans. On rare occasions a brush. For the sanding I have a selection of various shaped rubber pieces so I don’t risk hand sanding and ruining the details I took the time to carve. That’s basically it. Not sure if this answers you question, if not let me know. A quick example off the top of my head ( only because I just used it in another example) is the carving Bishops Crest. In that you can see the relative cleanness of the carving lines, smoothness etc. prior to sanding and painting . Thank you for the explanation. For the most part I carve in a similar fashion however it is the finish without the need for sanding that bugs me. As I gain more experience using my gouges I am able to do less sanding. When I asked about finishing tools I should have been more specific. Which gouge do you use to get a smooth finish without leaving tool marks. Is it your technique or is the tool or is it both. Chris Pye has a tool for finishing which is somewhat flatter than a Pfiel #2. Using the Sheffield numbering system it is called a #2 1/2. He explains that he had it specially made by Ashley Iles. Do you think this makes a difference? Oh, there is a need for sanding if you’re looking for an absolutely smooth surface, no doubt about it. I do it. You can carve though to a surface that is for the most part smooth,, but chisels do leave little facets no matter how you cut it. Something somewhere will have to be blended. I’ve known some carvers who at one point had to do some work where carving wasn’t allowed. They spent a tremendous amount of time to achieve amazing smoothness in the final surface, but if you looked close, VERY close you could see microscopic flats. Without sanding, this left a beautiful finish. Lets face it, the chisel leaves a surface that is smoother than a sanded one. And these tiny little facets were just beautiful. Then again , I saw this carver carve a Clematis flower, not sanded, and you swore he had to have sanded it. Probably one of the finest carvers I’ve seen, relatively unknown in most circles but in demand in the circles that count. But I wonder , where does it get used? You’re curious and might be considering getting one as well, right? Hmmmmm. A 2 1/2, oh such an esoteric tool to have custom made for you. Again, where do you use it? To clean up a cut made by a 5,,, or an 11? How wide is is? Where will it fit? One number in the Pfeil line generally goes from 2mm wide or so up to 25-30 or more in some cases. Do they make at least 10 different chisels in this “custom” size to only really clean up a cut made by a 2 1/2? 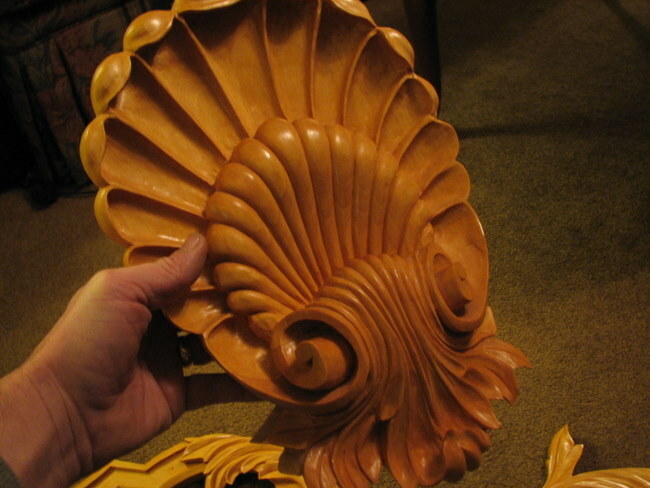 It won’t clean up the curved insides of a shell, nor egg and dart molding, won’t clean up acanthus leaves any better than a 2, or a 3 because that’s not the tool that most likely made those cuts. I’m sure many will get one just to “clean up” after a #2 ,, or whatever cut the 2 1/2 made. Other than that , it’s just another chisel. To clean up a cut made by a 3 for example, can be cleaned up using that 3, probably in a narrower width, or a chisel with a bit more curve to it such as a 5. 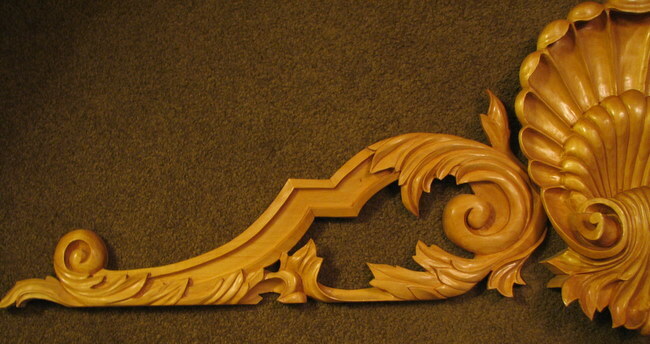 It’s difficult, if not impossible to get the curve of say, an acanthus leaf done in one pass. Nope, it’s a combination of passes, approaches, chisels to make one pass look like it was done in one fell swoop. A 2 1/2 in my opinion, because I’m not making a living by selling a line of books and goods, is a novelty. I’m sure many will buy it because the see their carvings aren’t smooth, and so and so said this will do it, they’ll get one and still wonder what they’re doing wrong because their carvings aren’t clean and crisp. Well, they were sold and are using the wrong tool. Make it easy,, when you want to finish off a carving, take the VERY CHISELS you used to carve it,, sharpen them as best you can , then go over the carving one last time. Something tells me the chisels will match the curves better than any other chisel that didn’t make those cuts. Hmmmm. Get a handfull of old chisels that were used to make really good carvings, and you won’t find a number anywhere on them. If the chisel matches the shape, that’s what you use. Many were just forged and who knows if it ended up as a 3 1/2 a 3 3/4,, or hey,, maybe we need a 3 7/8ths.. not a 3 1/2,, and not a 4. I defy you to show me one carving that needs such a specific tool that I can’t carve in all probability with the 20 or so I use on a regular basis. Then again, looking at some of the carvings,, I can’t figure out where it was used to “smooth or flatten ” a surface. One last item. I was sent at one time a chisel by a major magazine, that a chisel company was making for a “known” carver.They wanted my review. Upon opening the box I saw the theory of what they were trying to do,, but without even giving it a test run, to do the cuts they imagined ( I did say imagined) it would be useful for , I knew it just wouldn’t work and was an expensive piece to leave hanging on your wall to gather dust. The angles were wrong to provide a cut into a surface, since it just wouldn’t work. The handles got in the way and prevented the chisel from doing it’s job. For the price I could have bought two chisels that would do the job BETTER and be useful in many other situations. I told them essentially the piece was useless. Well, that’s not the answer they were looking for, got another carver to make up a review, and in his review if you knew how to read knew that something was off. But at least he gave a glowing review of something he probably didn’t use, and wasn’t the type of carver who needed it. Anyway,, a 2 1/2 is just another chisel not a cure all for cleaning up a carving. If you want to improve your carvings since it never is about carving by numbers,,grind all the numbers off your chisels and learn to carve by seeing the shape you want and getting a chisel that’s at least close to it. I’ve never reached for a particular number chisel when I’m working because it just doesn’t matter what the number is and I don’t care to know. I line ’em up on the bench, left to right with the flattest to the curviest then V’s. Then I carve. If the tool I have in my hand seems too flat,, well I just reach for one a bit more to the right. Some benches have hundreds of chisels scattered all over them. Arranged like a symphony orchestra. Curves over there somewhere, flatter ones over here, somewhere. It’s more efficient that way cause these guys aren’t selling tools, they’re producing carvings. Thank you for you insights. I always find your discussions helpful and have learned quite a bit by reading your thoughts on carving.